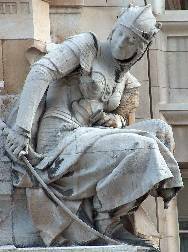 As something of a light-hearted interlude on these pages, I have put together this small selection of statues of warrior women. Perhaps as well as those with an artistic interest, whom I imagine form the majority of those who visit these pages, people who play wargames involving female fighting heroes, online or with miniatures, might find something of an appeal in the idea that Victorians and Edwardians were similarly enthused, and some inspiration in the pictures. We make a distinction here between two groups. The very muscular feminine type has long existed in art, with the Ancient Greeks on occasion producing some very athletic types, and most notably during the Renaissance, when some Italian artists would adapt their feminine subjects from the male body at a time when female models were not available, and anyway had a preoccupation with exploring anatomy and the muscular form. 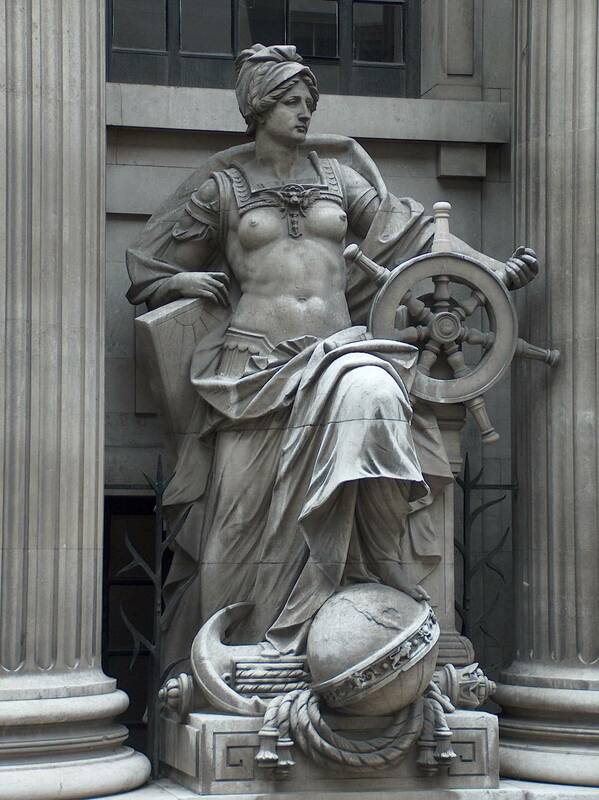 Only a few Victorians went this route, femininity being largely associated with softness and slenderness, and later, the influence of the French on many British sculptors (the New Sculpture movement) pushed even further away from muscularity. In the 1920s-30s there was a new, Deco interest in a stylised musculature, but that is beyond the scope of this page. 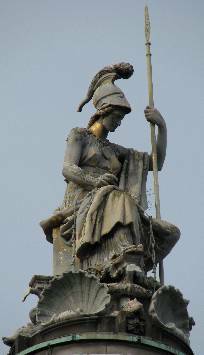 Much more frequent in Victorian times are the allegorical female warriors - above all Justice with her sword, and Britannia, more usually with a trident, as used by sea-deities (what we might describe as 'Britannia ruling the waves'). 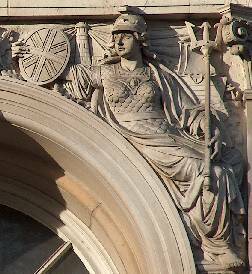 Figure from Cardiff Town Hall pediment. Starting with the champion female body-builder type, the best example we have is Albert Hodge, who made modelled anatomically correct but hugely over-muscled subjects, both male and female. 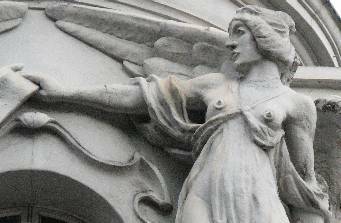 One of his figures is above, in Cardiff, has a raised arm of awe-inspiring girth. Hodge died young, and some of his work was completed from Hodge's designs and models by his assistant, Doman. The figure below left is one of these - the feature to look at here is her stomach. The figure above right is by the artist F. W. Pomeroy, one of the most important New Sculptors, and this rather solid female figure is fairly characteristic of his work. 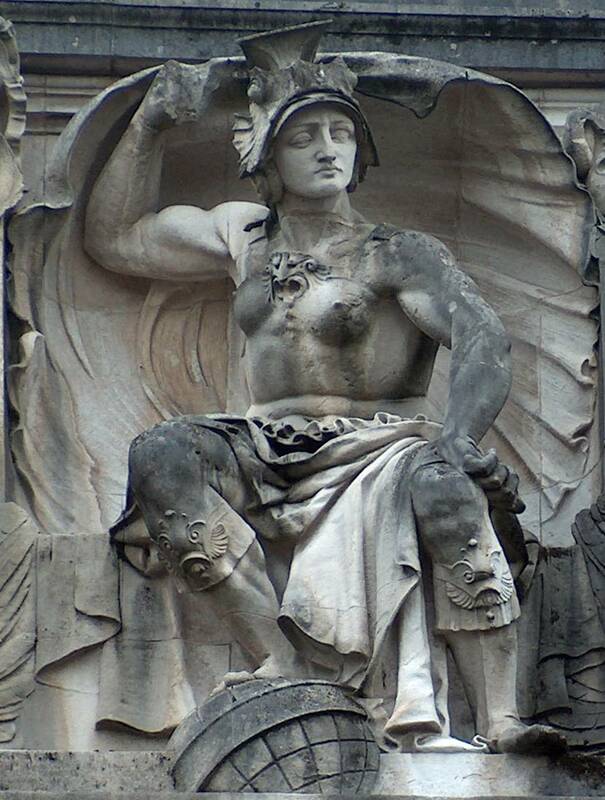 Note the excellent cuirass. 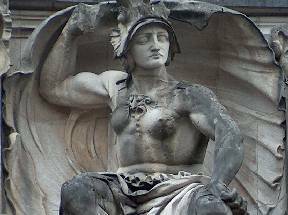 Below, a near contemporary of Pomeroy was H. H. Armstead, and here you may appreciate the splendid biceps and broad shoulders of his Africa , for the front of the Foreign and Commonwealth Office in Whitehall. We have more good biceps in this figure (below left) from the America group on the Albert Memorial, a warrior queen of the native Americans bearing a spear and a round shield. 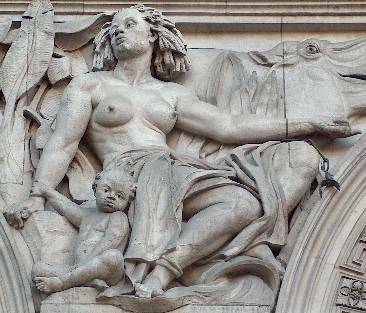 The sculptor was John Bell, and this is his most important work. 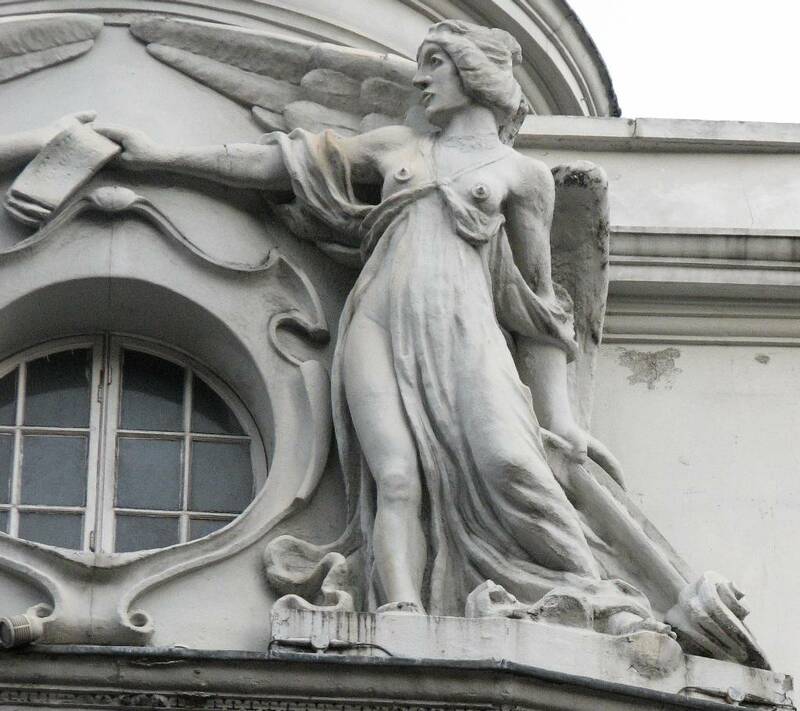 His other female figures tend to the rounded and feminine. 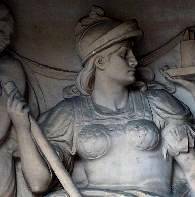 Below right is another tough female with spear and shield to fend off the spears from her enemies. 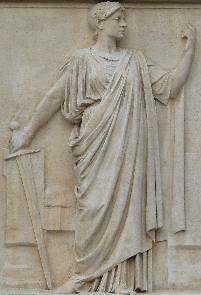 Her face and heavy masculine jaw, the taut muscles of her neck and throat, and her bulky raised arm and shoulder show a belligerence belied by her seated posture. This is from the Foreign and Commonwealth Office again, and again the artist is Armstead. 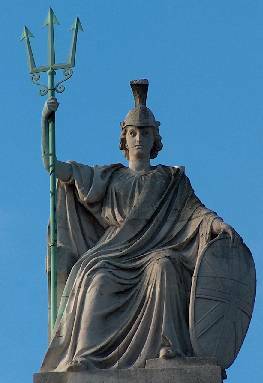 We move on to our allegorical figures now, and with Britannia, we are spoilt for choice (see also the Allegorical Figures - B page for more Britannias). 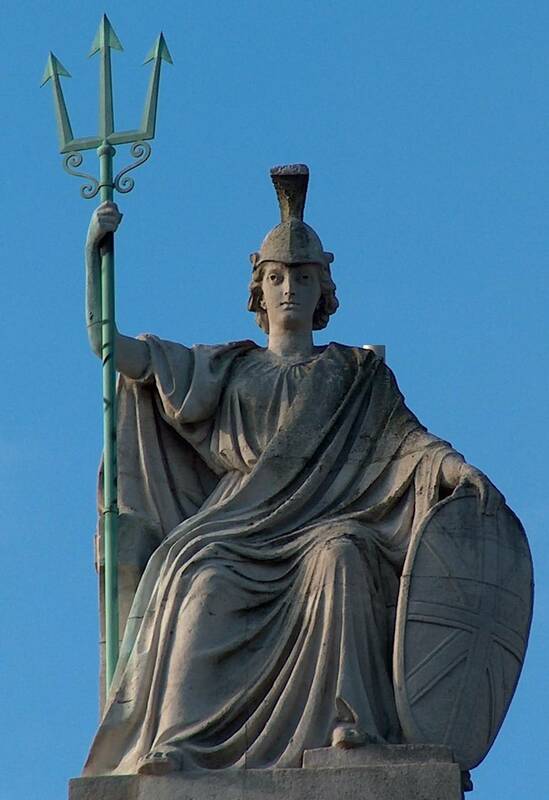 As noted above, she often carries a trident rather than a spear, and as well is usually helmeted, typically wears a mail shirt or a full breastplate, and has a round shield bearing the flag. 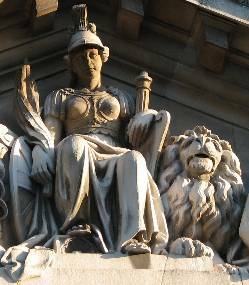 She often is seated on or in front of a lion, the national emblem, as in the figure below left, which is in the pediment of one of the two small outbuildings in front of where the Euston Arch used to be. For lots more lions, see this page. 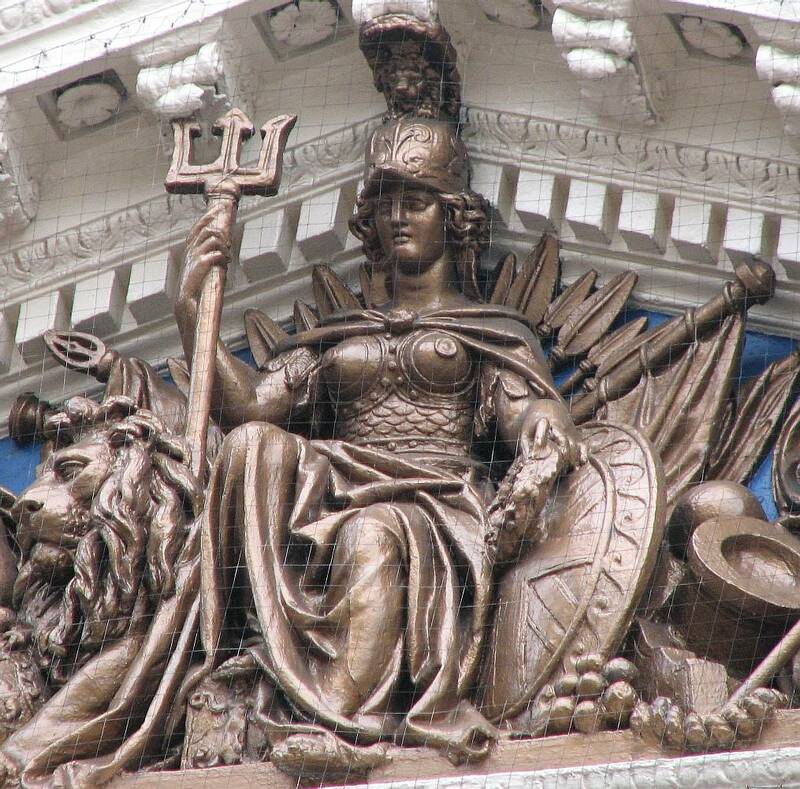 The Britannia below right, from a building on Piccadilly, has nice mail armour, and a particularly nautical aspect, with a lighthouse and ship's sails behind her (you will probably need to click on the picture to enlarge it to see this). 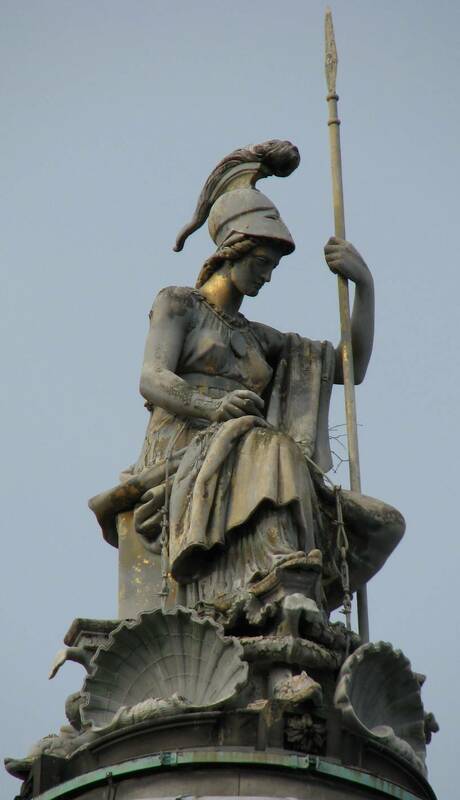 Another pair of Britannia figures. 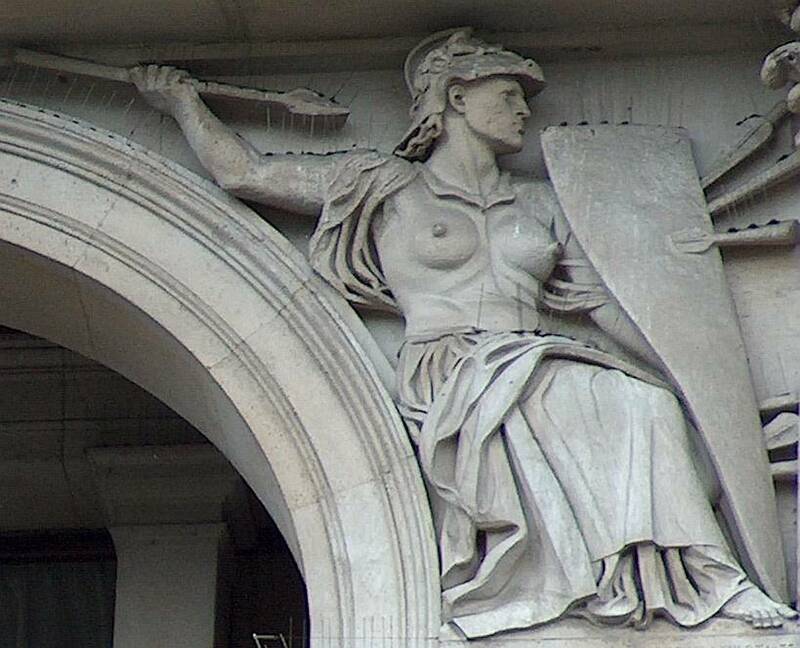 Below left is an archetypical one to be found on the front of the Royal United Services Institution, Pall Mall. 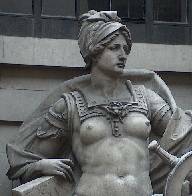 Another inventive treatment of female body armour, and the full panoply of nautical emblems including cannon in a very compact space. 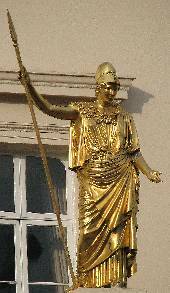 And the one below right is that on top of the Tate Britain building, a slender, girlish figure, Greek in costume if utterly Victorian in her visage. It would be nice to put other examples, but we move to Justice now. The most conventional form has her standing, holding her scales in one hand, a sword in the other, and with a blindfold across her eyes (several examples on this page). 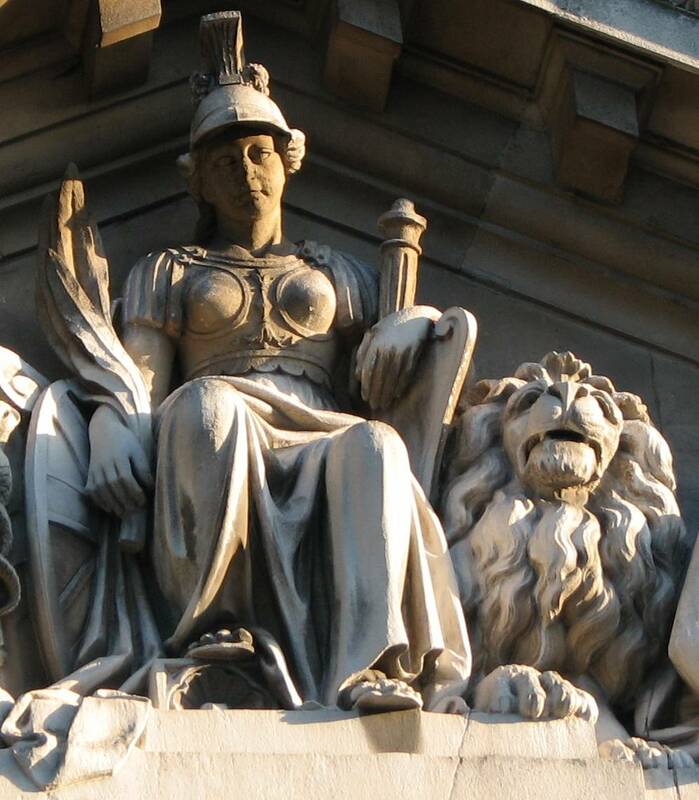 But we have as our examples below two rather different ones, both in Liverpool. 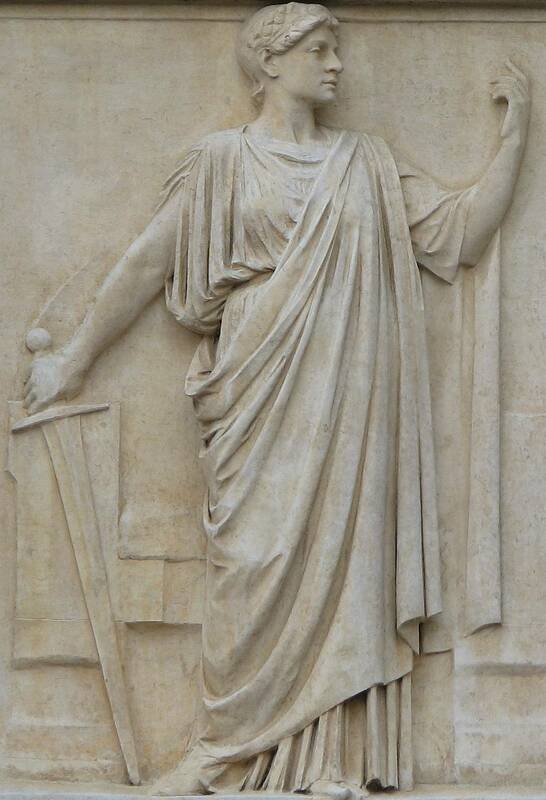 Below left, a splendidly unconventional seated Justice by J. C. F. Rossi, with Corinthian helmet, spear rather than sword - they make for a dramatic silhouette against the sky - and resting scales as two large shells. 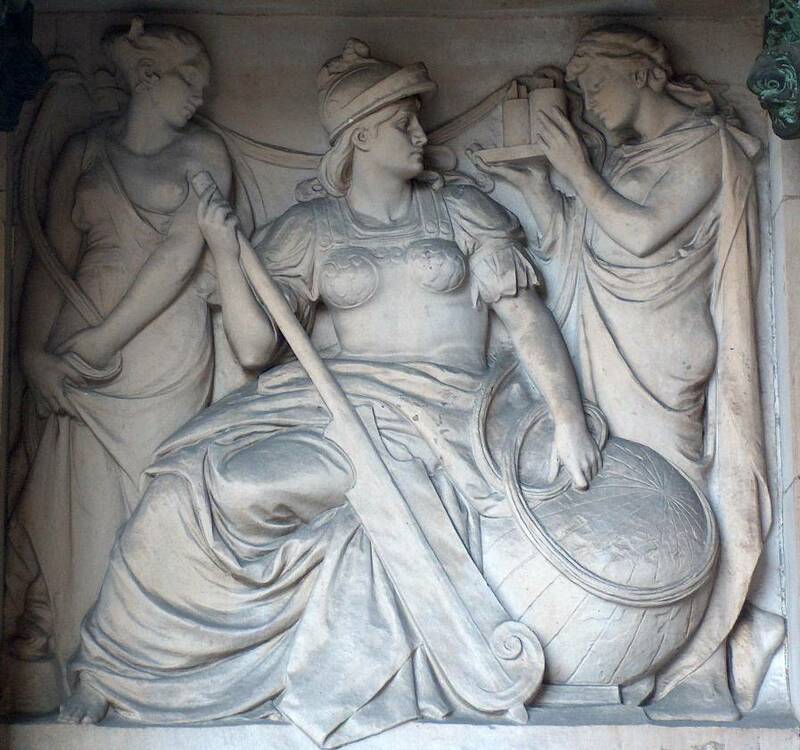 And on the right, the quieter, Hellenic Justice of the sculptor Stirling Lee on one of the panels of St George's Hall, a subtle, controlled composition. We move on to the Goddess Athena. Below left, she appears as a seated figure with spear, helmet, snake to denote wisdom, and her symbol of an owl on her shield, this elegant but simple figure being the work of John Henning Junior, as one of several panels on the exterior of Manchester Art Gallery. 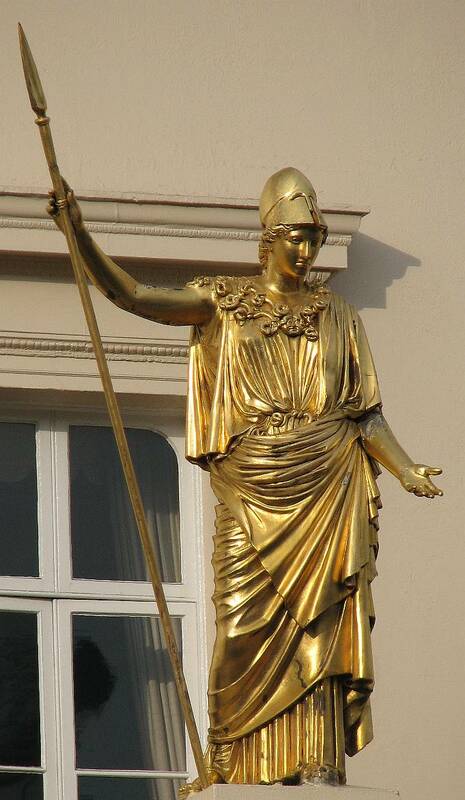 Below centre is the gilded Athena of the Athenaeum in Waterloo Place, by the distinguished sculptor E. H. Baily. To the right, we have an unidentified warrior woman bearing a curved sabre, which I chose because of her exquisite armour, evoking the covering of some sea creature. 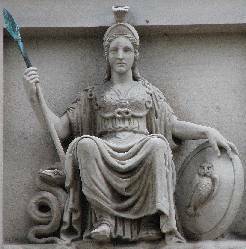 This one is by Paul R Montford, and is on the Royal School of Mines frontage of Imperial College, at the top of Cromwell Road and facing towards the park. 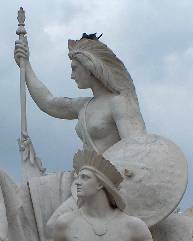 We may note that allegorical figures of Victory may also fit the sentiment and physique of the Warrior Women described here - For examples of these, see this page. 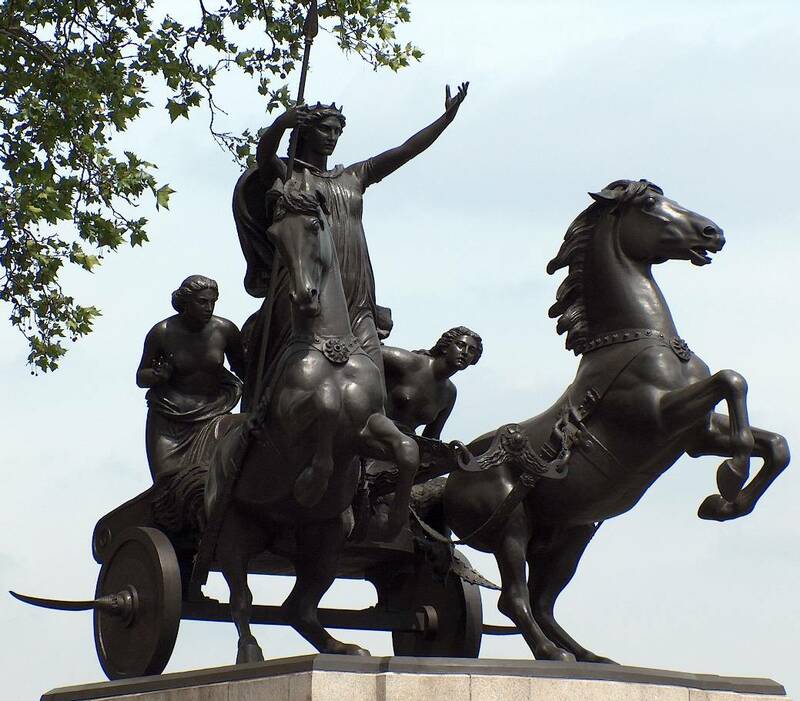 Finally, we end with the ultimate warrior queen, Boadicea, standing in her chariot with the sharp scythes on its wheels to cut down her Roman enemies. This magnificent group is by Westminster Bridge by the Houses of Parliament, and is from the hand of the sculptor Thomas Thornycroft.